I am floating in the underbelly of the city, the same way the summer my son was an infant, walking along the lake with him strapped to my body at dawn, I’d feel as if I were moving through the underbelly of the day. On this boat I take to work, floating under bridges and taking in new angles and facades of buildings, this city feels unfamiliar. It’s like looking into a face you’ve known for a long time and seeing an entirely new quality of beauty. I used to envy friends who were able to walk only steps from the train to their buildings but now I realize that I am the lucky one. After a thirty-minute train ride on which I review for the writing class I’ll teach later in the morning, I arrive in the city, walk a few steps, and my boat is usually waiting for me. I step off the pier at Wacker and down a few steps into the yellow boat. I usually sit uncovered on a bench in the back. Some mornings I’ll commune with the red steel bridges that we pass between Madison (1922), and the Michigan Avenue Bridge (1920). Other times it will be the glass facades of the newer buildings next to the old stone and turrets of the Crain Communications Building and the Wrigley Building. If the boat didn’t hit the cement at Michigan Avenue to disembark, I’d probably drift away with my thoughts all morning. I have always lived within walking (or running) distance from Lake Michigan, have come to know her moods and vicissitudes, to acknowledge the seasons through her shades of blue, green or gray. But the river and I have been casual acquaintances—until I started teaching at the Gleacher Center, along the main bank between Michigan and Columbus. I’ve admired the way the sun glistens on the ripples of waves, but I haven’t seen or thought much about what lives beneath the river’s surface—until today. Beyond the surface there are fish, and an undercurrent that moves water back towards the lake. Once the Chicago River flowed into Lake Michigan. But as “the stinky river” got more and more polluted, the water was redirected toward the Mississippi. 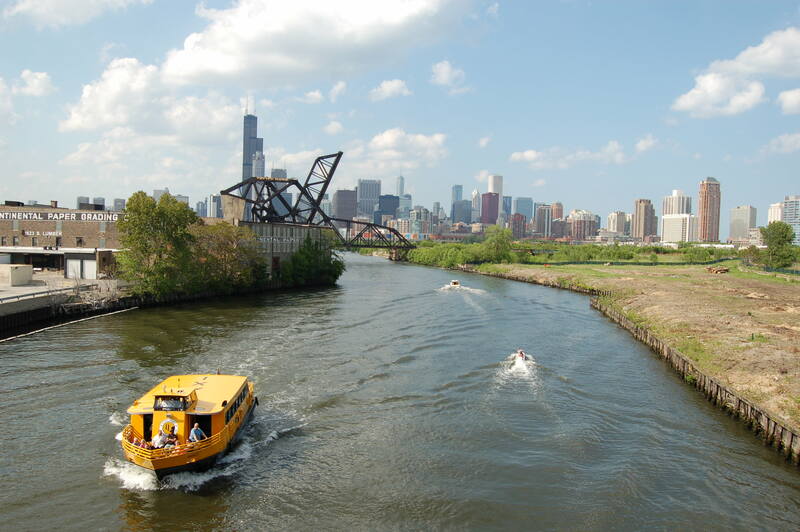 In 1900 the Sanitary District reversed the flow into the Chicago Sanitary and Ship Canal to avoid polluting the lake with river waste. The river is by no means pristine, but especially on the North Branch people continue to catch fish and crew teams continue to row. There are smallmouth and largemouth bass, bluegill, catfish and carp. There is not much fishing on the South Branch, once the sewer for the stockyards, and where barges still travel. The jury is still out on just how toxic the river continues to be. Scientists at the University of Illinois at Chicago and the Metropolitan Water Reclamation District of Greater Chicago just completed a large study and found that canoeing, kayaking or catching a random splash of water on the river is no more risky than doing the same activities on “cleaner” area rivers or lakes. The Federal EPA would like the water to be clean enough to swim in but the Water Reclamation District, which maintains the water’s standards, says it would cost a billion dollars to do so. And that has never been the purpose of the river. The river moves people and barges and was built to keep waste out of Lake Michigan where we can still swim. Still the river has come a long way from those days, from “the sluggish brown stream” the poet Edward Hirsch describes in his poem “Family Stories” where the river is a central character in his saga of Chicago history, the river that still flowed into the lake. Water service was born in 1962 when the Wendella Sightseeing Co. started a rush-hour commuter service between Michigan Avenue and the Northwestern Railroad Station. 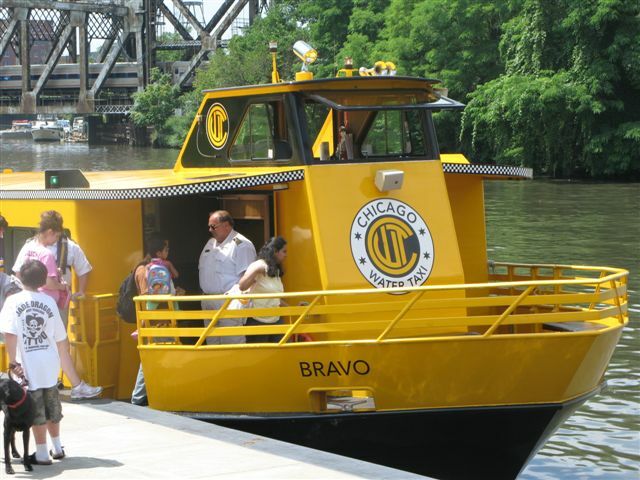 Since then, the RiverBus, as it was known for a while, now Chicago Water Taxi, has safely carried an estimated four-million rail commuters. 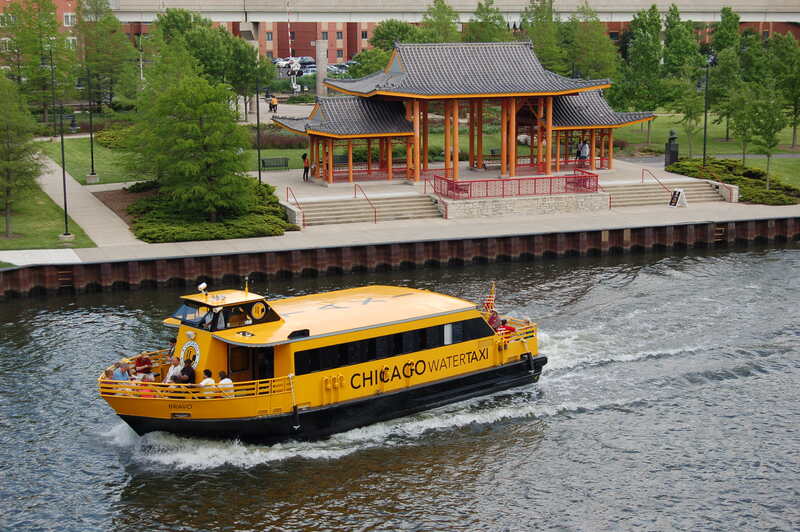 In 2006, the water taxi documented more than 19,000 departures. 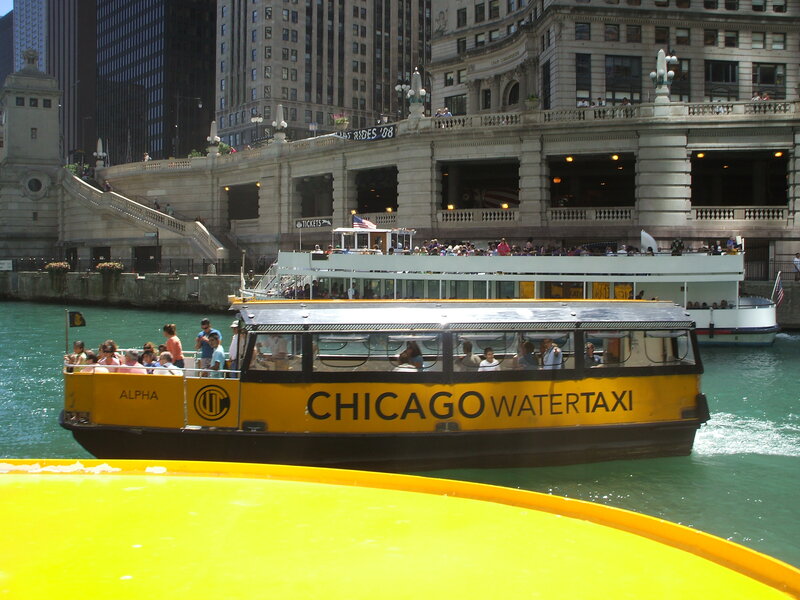 The Chicago Water Taxi operates on a closed-loop route shuttling passengers between Madison Street and Chinatown on the South Branch and LaSalle Street and Michigan Avenue on the Main Stem for a $2 fare. During the summer and early fall, the boats depart and arrive from seven in the morning until seven at night. Historically, the boats stop in October with the first chill of autumn; now they’ll run into December. The river can be just as moody as the lake. The temperature outside plunged to the middle forties, hats covering the heads of children off of school, the water seems darker and full of movement from the first winds of autumn. As I wait on the riverbank bench between Michigan and Wabash, I absorb, as if for the first time, modern office buildings with tinted glass windows, the old stone of Chicago’s golden domes, the filigree of iron on the Chicago Avenue bridge. I sit inside on the way to class and notice the loafers of a gentleman who’s been on the same taxi as me the last two trips. I remember when one of his buddies, who’d been complaining about the discomfort of his own new shoes, had commented to his friend about how much more comfortable his shoes looked. These are the Monday morning boat buddies—nine o’clock shift. On the way back I brave the elements and sit outside, although the wind stings my fingers. Kids climb all over, expressing the enthusiasm that I still feel about this ride but that I think my fellow passengers either lack or conceal. Sailing to and from class makes me feel like a traveler in a foreign country. My brown backpack filled with books at my side, my eye alert to the passing terrain, I am on the outside, watching the city I once thought I knew, as it becomes unexplored territory. When I’ve spoken to married women who find they have crushes on other men, the most common explanation is the desire to return to the thrill of discovering someone for the first time, to open a new book and begin with the first sentence—and to be looked at that closely as well. Is the river discovering me as I newly discover it? I can’t help but notice the fumes, the sludge, the smell of sewer. My father, a biochemical engineer for the Sanitary District, spent part of his career in water reclamation, trying to clean this up. It is still a glorious day, the river glistening with autumn light, green waters, blue skies. Especially on the water, there is still a chill in the air, mostly under bridges, shielded from the sun. Other times we are between buildings protected from everything but wind and water. The woman who opens and closes the gate to the water taxi has a nametag that says Michelle. I want to know what she sees as she looks out at the water all day from the bridge at Madison to the bridge over Michigan—but to speak would make me conspicuous when all I want to do is blend into the water and observe. Today I am struck by the façade of the Civic Opera House, and how one sees a city differently from the angle of water. I sat inside that building, listening to opera with my husband when I was pregnant with our daughter, and I admired the grandeur of the chandeliers, red carpets, nineteenth-century opulence. But the Latin letters engraved on the outside speak of a more profound history. As I study the opera house from the vantage point of river, I remember how this summer, floating along the Seine, I understood Paris better by seeing her contained by water. Inside the Louvre I felt lost, looking first for Mona Lisa’s smile, but from the outside I saw it all, the sprawling expanse, and I understood, in a more concrete way, how central it is to the city and the world. But by seeing Chicago from the river, it is neither more or less. It is simply different, older, unpeopled. 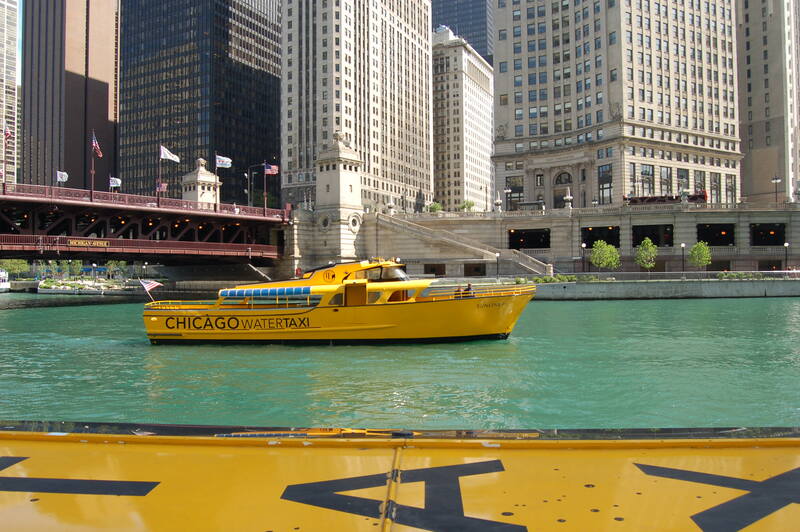 Thus far the water taxi has shown its devotion by always being there when I step off the 8:18 train from Evanston. Today I thought I’d test the waters by taking the 8:40 Metra from Main Street, arriving in Chicago twenty minutes later than usual. I wonder if on this shift I’ll discover any familiar faces on the train ride down, someone to complain to about the damp day, my virus, my husband away at a conference and me having to drive the 7am carpool shift. I find no friend but gaze idly out the window, having planned my class in advance. I am greeted not by sludge at the river, but by debris I’d never noticed before, just below the Madison Street Bridge: beer cans, paper, cups left over from the weekend’s festivities. When the water taxi arrives after a short wait, I realize it is the friend I had craved. Dressed in orange lights, a carved pumpkin is on the inside door seat where I sit today to avoid the wet from an early morning drizzle. This little crush I have on the water taxi has the potential to sail into a full-blown love affair. But of course he is married to the river and I to my dear husband. But I miss him on days that I drive and I’m already trying to figure out how to extend our relationship beyond the term’s end or the river’s end. My mandatory morning commutes will end by late November, but the taxi keeps running through December. Suddenly I want to know everything about it, to see him through all seasons, with Christmas trimmings and even what happens when the water begins to freeze. In writing class, when we try to find a nice way to describe what isn’t working in someone’s essay, I say I feel like I am floating from graph to graph but not getting anywhere. The boat and river remain with me while I teach. The longing I feel on the train or when walking alone through the city fades. I am swept up in the words of my students, the workshop process and the larger contexts we need to tap into to make our writing better. Their essays are small windows into their lives. I begin to see them more and more as individuals. Yet the way they suffer is universal. We are buoyed by the way words connect us to each other’s lives. Things are getting serious. Instead of stopping for my usual salad bar after class at the Riverwalk Café, I go straight out to the water. Of course I’m not as hungry because of my virus, but part of me just wants to keep floating. Not to stay put. On the way back to Madison Avenue I return to the inside cabin, next to the pumpkin. They turned the heat on so it is cozy and warm. I can’t see the water, only the tops of bridges, the upper halves of buildings: Chicago Sun-Times, glass, steel and stone. I’m part of the early morning rush hour, waiting for the Metra. It is normal commuting time for most, including two acquaintances who are distressed by an apparent delay. We are waiting for the 7:50 train that the announcer says will be fifteen minutes late. One gentleman says now we’ll have to ride with the eight o’clock riffraff. When I confess I’m usually an 8:22 commuter he says, only half joking, that I am really riffraff. One woman is concerned she’ll be late for her 8:30 meeting. I, on the other hand, am calm, knowing the taxi will be there whenever I arrive. This throng of people is both unpleasant and unfamiliar to me. It makes me feel lonelier. The delay they keep referring to is because of the weather but the weather is light rain. This same light rain caused me to get on the early train instead of walking to the local café to prepare for class. I thought that maybe the thing I’m really looking for could be found on an earlier train that leaves at the right hour. What I find when I get downtown is the rush-hour water taxi. It is a larger boat with a long bench in the center covered with clear plastic. The rain is just petering off and yet the water is still choppy. At first I sit uncovered, hoping to commune with the river, but the bench is wet so I move inside and gaze into the bridge at Lake Street realizing there is a track on top of it, as a train passes by: the double-decker bridge. There is no one to talk to in the morning. This makes me lonelier than when I am by myself in a large house. In the world, the thing I’m looking for may be there but isn’t. As we float toward Michigan Avenue, the sky begins to clear but the boat driver points out the darker clouds on the horizon. I realize today, traveling among the rush-hour crowd of commuters, that the water taxi is not just for those with the luxury to drift to work unhurried or for shoppers or tourists, but is for everyone. The boat driver who I thought understood something more about the sky than I do, was wrong. The dark clouds of morning have passed and during my much-less-populated trip back, a taxi is waiting and three of us head back toward Madison under sunny skies. I sit outside, notice the autumn leaves in the water and the sign that says Do Not Anchor Under Bridge. When I get off the boat, too early for the train, yet not enough time to really get anywhere, I realize that I am unhinged. Among this healthy amount of floaters on this warm Monday morning 8:50 shift, is the guy with the loafers, still shiny, the blonde woman who likes to sit outside on the deck and other now-familiar faces. I’ve become intimate enough with the taxi to notice the not-so-subtle changes: it is not even Thanksgiving and he is all lit up for Christmas. This trip is familiar enough now that I almost consider reading, until the Wells Street Bridge that I somehow never noticed before stops me when I see that it, too, is double-decked and bascule, a drawbridge. When I get to Rush Street, the stop for Michigan Avenue, there is a sign confirming what I’ve feared most. Our ride is over. Due to construction, this will be the last week that this stop is available. Sometimes a clean break is necessary. I thought we’d sail through December but in some ways that just draws out the agony of our inevitable departure from one another. The truth is, the taxi lulling me to class these mornings has reminded me how to live again, in the underbelly of the day. The infant who I carried along the lake during the wee hours of his life, who reminded me to rise with the sun, is in third grade, carrying his own pack on his back. Since then I’ve gotten lost in the rhythms of what distracts from rather than what gives life to the day. This floating before the day officially begins reminded me how the long pause, the looking out into water, taking time to see from a new angle whether it be lake or river, land or bridge, whether the water is flowing east or west, is what I need to keep; to take a deep breath before the day begins.